TATS A KOOL CHALLENGE: Tenth Day Of December! Another beauty! I'd love to make it in my new thread that arrived today, but I must finish those socks for the granddaughters first! Prioritizing is not one of my favorite tasks! I love that thread. I have some of the other colors, like the orange...it's to die for! I'm amazed at how quickly you crank out those snowflakes my dear! It's so nice to hear of a pattern that is "an absolute joy to tat"! - that's the kind I like best, I don't look for challenges when I am tatting! One of the aspects of this journey of yours which I am really enjoying, is watching the snowflakes appearing in every colour but white! - and they all look festive and beautiful. 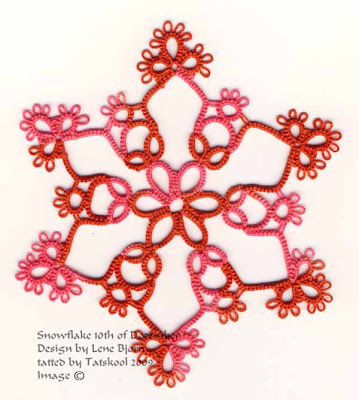 I have so much trouble choosing colours, unless they are pink-and-green, that I think I would automatically tat a snowflake in white thread, so I am learning a lot! Surprisingly, the colours I had to choose when building this house all fell into place - I think that may have been due to the absolute necessity of meeting the deadline - I wasn't able to "dither". I still have to send you the picture of the HDT against my wall - camera is working now, I haven't forgotten! It's beautiful and I really love the thread color. ...back to reality!!! Ha ha! You crack me up! Your latest snowflake is a beauty! What a talented lady you are! I love the shape of the chains on this one. Now that is gorgeous! And so is the thread. That looks like a fun one to do, too. I was going to try the block tatted one last one, but got cold feet instead. I'll just admire yours. I must have been day dreaming when you said Vanilla Sky would be in your shop. Will there be more of the size 60 or 80? If so, put me down for two skeins. Hi Diane, socks, socks socks, dratted socks! Hi Krystle, Yup Oren Bayen seems to have stronger colours and less white than Altin Basak. I like it better. Hi Maureen, yup a joy to tat is good. Yup everything but white, except on my tree!! I LOVE white snowflakes. HI Chic, I specialise in cracking you up! Hi Steph, you can do the other block tat one no problem, print the photo in reverse and just study it and concentrate at every join.